He called himself Muslim American Spokesman for Human Salvation and encouraged the common people and leaders of all religious traditions to return to the purity of their faith. Others called him “America’s Imam”; leader of the Muslim American Experience. He defined it, gave direction to it and devoted his life to it. Imam W. Deen Mohammed worked for the establishment of Muslim life in America and for freedom, justice and equality for Muslims, African Americans and all people. He both taught and demonstrated that Al-Islam is not only compatible with democracy but in fact gave birth to these same principles. His followers have proven that there is no contradiction between living a Muslim life and that of an American citizen. 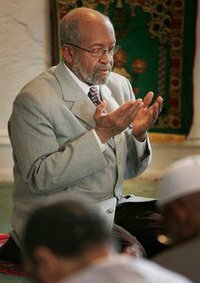 From 1975 to 2008 Imam W. Deen Mohammed traveled America and the world promoting interfaith cooperation for the common good of all, that humanity might achieve human excellence. Born Wallace Delaney Mohammed (1933-2008) he was the seventh child of Elijah and Clara Muhammad builders of the Nation of Islam (1932-1975). Upon the passing of his father in 1975, he was voted leader of the Nation of Islam and immediately began to bring members of that community to the proper worship of G-d. He praised his father, the Honorable Elijah Muhammad, for the good he did for forty years in raising the consciousness of the Black man and woman in America; equipping them with love for themselves and courage to do for themselves. He said “That which is consistent with the Qur’an we will keep, and that which is not, we will let go.” At the same time he addressed the psychological and social damage the Caucasian image of G-d imposed on African Americans as well as Caucasians for millennia. Within a span of ten years he had transformed the former followers of his father from the worship of G-d as a man to the universal religion of Al-Islam contained in the Qur’an and the life of the Holy Prophet Mohammed (prayers and peace be upon him). This made him singularly responsible for what many observers consider a “modern day miracle” – the largest conversion to Al-Islam in the world in the twentieth-century. In 1977, he was responsible for leading the largest delegation of Muslim Americans in history to Hajj, the Pilgrimage to Mecca. Imam W. Deen Mohammed introduced the Qur’an as the verifiable authority that human identity comes from G-d and human beings were created in excellence. This was the basis for his initiation of CRAID, (The Committee to Remove All Racial Images of Divine) in 1978. CRAID energized significant dialogue among Christians and Muslims around the topic of the effects of racial images in worship. This dialogue resulted in the attenuation of inferiority among African Americans and the removal of the Caucasian image of G-d from numerous church premises. Recognized as one of the most significant religious leaders of the twentieth-century, Imam W. Deen Mohammed served as leader of the Parliament of the World’s Religions in 1995. In March of the same year he was the keynote speaker at the Muslim-Jewish Convocation in Glencoe, IL and visited Israel and Jordan in 1999. His relationship with the Focolare Movement of the Catholic Church and Lady Chiara Lubrich is unprecedented. He is the only African American and Muslim to have spoken from the pulpit of the Vatican – addressing over one hundred thousand – at the invitation of Pope John Paul II, in 1999. His tributes include Signatory to the Williamsburg Charter Foundation “First Liberty” Reaffirmation Ceremony for the Freedom of Religion, June 25, 1988; the Cup of Compassion Award from Hartford Seminary; Honorary Doctorate Degrees and numerous other prestigious awards. His portrait, commissioned by Morehouse College, hangs in the MLK, Jr. International Chapel with President Jimmy Carter, Martin Luther King, Jr., Nelson Mandela and Dalai Lama. He was awarded the Gandhi-King-Ikeda Award and inducted into the MLK, Jr. International Board of Preachers. His emphasis on the Revival of Religion included the Muslim world which in 1975 was dormant, mired in global polemical issues and not living up to the historical excellence of the traditions of Prophet Mohammed (ppbuh). As such, Imam Mohammed refused to align the new community of Muslims in America with any foreign government but said, “We only support the good they do”. He rejected the language of Orientalists, such as the term orthodox Islam, and avoided sectarian labels of Sunni and Shia preferring to define his followers as seeking to demonstrate the uswaah (character) of the Holy Prophet Mohammed, (ppbuh). As a special guest of the OIC (Organization of Islamic Conference) in Tehran 1997, he worked to erase distinctions between those called Sunni and Shia and reminded them that those descriptions did not exist during the life of Mohammed, the Prophet (ppbuh). The distinction of being the first Muslim to offer the Invocation in the United States Senate in 1992 was punctuated by the accolades offered by the three Senators that sponsored him and the 500 guest reception which followed. From the beginning of his leadership, Imam W. Deen Mohammed championed the cause of women, as did his father. He dismantled the male and female classes the FOI and the MGT-GCC without bloodshed or conflict. Muslim Girls Training became Muslim Women’s Development Class which encouraged women to pursue their G-d-given talents in the home and the society. CERWIS (Committee to Enhance the Role of Women in Society) was established to address the larger social issues that hindered the elevation of women in society. He supported the equality of male and female with the Qur’an and brought women into leadership positions while continually stressing the importance of moral behavior and family life. To Imam Mohammed education was the number one priority of the Muslim community. He renamed the University of Islam schools, Clara Muhammad Elementary and Secondary Schools in honor of the dedication and sacrifices of his mother. The schools have been lauded by government and civic leaders as a contribution to educational excellence. In July, 1977, he held up the American flag told his supporters to vote and established New World Patriotism Day; parades were held throughout Chicago and other major cities. He advised his supporters to claim their share of life in America. to an audience addressing “The Earth – Our Home” promoting responsibility to the earth and the environment. In the early 1980’s Imam W. Deen Mohammed introduced the concept of New Africa and said “There are two things I will never give up, Al-Islam and my African American identity”. He envisioned model communities that reflect the best of African, Muslim and African American identities and continued to stress economic development, do-for-self ownership and collective economics to provide economic stability. Imam Mohammed believed that with The Qur’an, skin color – Black – was no longer an organizing principle for African Americans, that the Nation of Islam’s focus on Blackness had sufficiently served its purpose. He said that Muslim African Americans were a new people born out of Revelation (The Qur’an) and he introduced the community to the Muslim African Ancestor, Bilal ibn Rabah, who provides dignity and direction. Bilal who was a slave to the Arabs, was liberated by Al-Islam and became the first Treasurer and Muezzin to the first Muslim community. Bilal called Believers to prayer five times a day. Imam W. Deen Mohammed coined the term Bilalian in his honor to replace Black which did not have the depth of dignity required for a new people. Bilalian was used only for a short period because some in the Muslim world and in America suggested he was developing a “cult”; to avoid that designation, he stopped using the term. Imam W. Deen Mohammed said, just as Bilal stood on top of the Ka’ba and called the faithful to prayer, “It is the prophetic destiny [of Muslim African Americans] to call all of humanity back from the seeds of destruction to the straight path of the true worship of G-d”.